The "dose makes the poison" is a common adage in toxicology. It implies that larger doses have greater effects than smaller doses. That makes common sense and it is the core assumption underpinning all regulatory testing. When "the dose makes the poison," toxicologists can safely assume that high dose tests will reveal health problems that low dose exposures might cause. High dose tests are desirable because, the logic goes, they not only will reveal low dose effects, they will do so faster and with greater reliability. Greater reliability and speed also mean less cost. 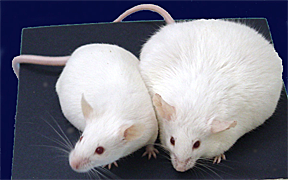 While exposure in the womb to 100 parts per billion of the estrogenic drug diethylstilbestrol (DES) causes mice to become scrawny as adults, exposure to a much lower amount, 1 ppb, causes grotesque obesity. This photograph compares a control animal (left) to an animal exposed to a very small amount of DES in the womb (right). Photograph from Retha Newbold, NIEHS. The trouble is, some pollutants, drugs and natural substances don't adhere to this logic, as can be seen in the photograph above. Instead, they cause different effects at different levels, including impacts at low levels that do not occur at high doses. Sometimes the effects can even be precisely the opposite at high vs. low. Because all regulatory testing has been designed assuming that "the dose makes the poison," it is highly likely to have missed low dose effects, and led to health standards that are too weak. Measuring how much of a compound, called its dose, produces a response, usually some kind of health effect, is difficult and time consuming. To understand how dose and effects are linked, toxicologists expose animals, tissues, or cells to pollutants. They then examine how the subject responds to the exposure. In standard toxicology, as the dose increases, so does the effect. Conversely as dose decreases, so does its impact. This relationship is called a monotonic dose-response curve because effects are either increasing or decreasing. In a monotonic curve, they never reverse direction. It is akin to a dimmer switch and a lightbulb. The more electricity you let through by turning the knob, the brighter the bulb gets. The diagrams to the right present idealized forms of monotonic (left) and non-monotonic (right) dose-response curves. Monotonic can either be linear or non-linear. The key point is that the direction of the curve never changes from positive to negative or vice-versa. A monotonic curve can flatten, i.e., reach an asymptote. Non-monotonic curves, in contrast, change direction. Over part of the curve, response increases with dose, while over another portion it decreases as dose increases. 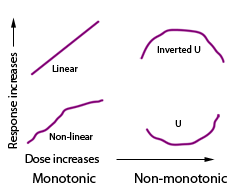 Non-monotonic curves are often called 'inverted-U' (upper) or 'U' (lower). To set exposure limits, three to five doses of a substance are tested in the laboratory. Toxicologist start at the highest dose chosen and continue to lower doses until they find the point where effects are no longer detectable, that is, the dose at which experimental animals no longer differ from controls. This safe dose - the lowest amount that poses an acceptable risk - is called the 'no observed adverse effect level,' or NOAEL. Traditional toxicology guiding health regulations rarely tests doses lower than NOAEL due the 'dose makes the poison' assumption. The final acceptable level for human exposure--called the 'reference dose'--is calculated from the NOAEL by adding a series of safety factors. These safety factors take into account uncertainties in extrapolating animal research to human, as well as differences in sensitivity among groups of people, and between kids and adults. Thus if the NOAEL is found to be 1 milligram per kilogram of bodyweight per day (which corresponds to a part per million), then the refence dose might be 1 part per billion per day. While toxicologists have traditionally assumed that the dose makes the poison, endocrinologists --scientists who study the action of hormones-- have long known that hormones can have different effects at diffferent doses. The graph below comes from a simple study looking at the response of a gene inside a cell as it is exposed to different amounts of estradiol, the common form of the natural human hormone, estrogen. In the experiment, the scientists experimented over an extremely wide range of doses, from around 10 parts per quadrillion (ppq) to 10 parts per million (ppm). Most estradiol in human blood is bound up by special proteins. When bound, it can't interact with hormone receptors. Because that interaction is a crucial step in the process that turns on estrogen-responsive genes, bound estrogen doesn't turn on genes. Only the unbound estrogen can, and its concentration in human blood is normally in the green zone of the graph, parts per quadrillion to low parts per trillion. As the dose of estradiol rises through the green zone of the graph, the response increases. This green zone is the range of concentrations over which unbound estradiol is found in blood. Could this mean higher doses are safer than lower doses? Emphatically, no. At the highest doses used in this experiment, the system was no longer able to respond to estrogen signaling. That means that crucial events under the control of estrogen would not occur. The consequences, for example, of shutting off estrogen signaling responses during development would most likely be catastrophic for the organism affected. Initially, at just above 1 part per quadrillion, there's no difference between the control (0 estradiol) and the response to estradiol. As dose increases up to just above 1 part per trillion, the response increases. It then flattens out, over a wide range of doses, all the way to 100 parts per billion. But once it gets into the high-dose range, it drops, and by just over 10 parts per million the system shuts down, with no response whatsoever. What's happening? As estradiol increases in the low dose range, it is binding with receptors and stimulating the responsive gene. This is what is supposed to happen over this dose range, the range found naturally in people. However, as receptor occupancy increases above 10%, a feedback loop cuts in, leading to a reduction in the availability of additional receptors. As dose increases further, the effect of the feedback loop grows until no amount of additional estradiol can increase the system's response. That produces the long flat portion of the graph, from just over 1 ppt to 100 ppb. As doses rise above 100 ppb, estradiol becomes overtly toxic to the cell and the system stops responding completely, dropping even below the control level. This dose-response curve dramatically violates the assumption that high dose experiments can be used to predict low dose results. At high doses, estradiol shuts the system down. At low doses it turns the system up. Over part of the dose range, response increases, while over another part, it decreases. This curve is called a non-monotonic dose-response curve. Consider this 'thought experiment.' Think again about that light bulb hooked up to a dimmer switch, but instead of running it through your normal wiring (110 volts), plug it into the circuit for the dryer (220 volts). When the dimmer is turned down, there's very little light coming through. Turn it up and the light gets brighter. Turn it all the way up and the light bulb blows up. All of a sudden, it's dark again. There was more voltage and current than the system was designed for. With 'dose makes the poison' thinking dominating toxicology, traditional toxicologists didn't pursue the possibility that there might be effects at levels far beneath those used in standard experiments. No health standards incorporated the possibility. Over the past 15 years, however, as scientists began to explore the impacts of endocrine disrupting compounds-- compounds that behave like hormones or interfere with hormone actions-- many examples of non-monotonic dose response began to be published in scientific journals. In 2006, a team of German researchers published a vivid example of how traditional toxicological testing to set health standards can miss low dose effects. Their work examined the effect of a phthalate on the activity of an enzyme in the brain of developing male rats. This enzyme, aromatase, converts testosterone to estrogen. Counter-intuitively, estrogen early in life is necessary to masculinize the brain of male mammals. If they don't get enough, key parts of the brain that normally differ between males and females will be more similar to the female form than the male form. Their results, seen to the right, show that doses from 15 mg/kg/day to 405 mg/kg/day (statistically significant in purple) cause an increase in aromatase activity. Intermediate doses (1.215 and 5 mg/kg/day) do not differ from control (the blue horizontal line) But lower doses suppress aromatase activity (statistically significant in red, 0.134 and 0.405 mg/kg/day). 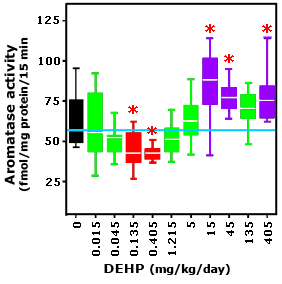 As the research team point out in their article, a regulatory test for DEHP effects would not have gone below 5 mg/kg/day and therefore would have missed the significant aromatase suppression at lower levels. Adapted from Andrade et al. 2006. 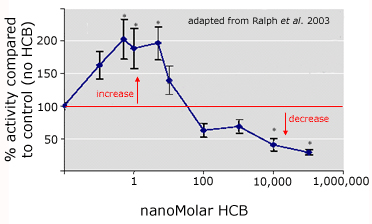 Many cases of non-monotonic dose-response curves have now been published in research on endocrine disruption. Below follow some recent examples. Because they are now being reported frequently in research on the effects of endocrine-disrupting chemicals, it is clear that regulatory toxicology can no longer safely assume that 'the dose makes the poison.' It is also clear that the standard approaches used to develop estimates of safe exposure levels, by basing their design on a false assumption, are likely to have set safety standards that are not strong enough to protect public health. Narita et al. report that a key step in immune reactions, the release of histamine and cytokines by mast cells, is exacerbated by very low levels of environmental contaminants, similar to the effect of estradiol. These experiments, done in cell culture, used levels of the contaminants well within the range of human exposure. The peak response was seen at approximately 0.1 parts per billion (10-10 molar). By the time the dose rose to 10 parts per billion (10-8 molar), the response disappeared. This experiment was done with mouse and human cells in culture. Graph adapted from Narita et al. At doses far beneath the current EPA safe level, Takano et al. 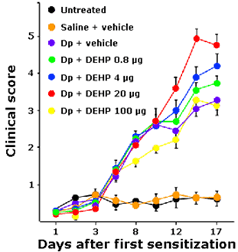 found that the phthalate DEHP increases the immune response of mice to a common allergen. Clinical scores of an allergic reaction were strongest at intermediate doses (4 and 20 µg). A dose of 100 µg (yellow line) was no different than the control (purplish blue line). Graph adapted from Takano et al. Working with a suite of compounds that bind to a newly discovered estrogen receptor on the surface of the cell membrane, Wozniak et al. found that calcium influx into cells and prolactin release (graphs to left) follow markedly non-monotonic patterns. Bisphenol A provoked responses at the lowest dose tested, 0.23 parts per trillion. Bisphenol A has been considered a weak estrogen because its relatively binding affinity with the estrogen receptor in the cell nucleus is much lower than that of estradiol. 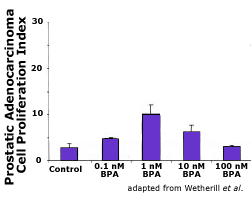 In contrast, with this cell membrane receptor, bisphenol A is just as powerful as estradiol. Graphs adapted from Wozniak et al. Ralph et al. discovered that prostate cells respond in a non-monotonic fashion to exposure to the organochlorine pesticide hexachlorobenzene (HCB). 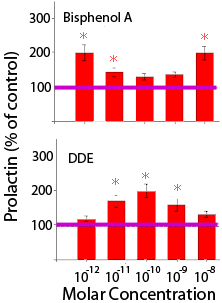 High levels suppress androgenic activity of the cells relative to controls (red line), whereas low levels enhance androgenic activity. Their experiments with live mice revealed that prostate weight in adult mice also showed that high doses produced the opposite effect of low doses. Wetherill et al. found that a one nanomolar dose of bisphenol A yields the strongest proliferation response by prostate tumors in experiments with cells. The impact of a dose 100-times higher didn't differ from control. Newbold, RR, E Padilla-Banks, RJ Snyder and WN Jefferson. 2005. Developmental Exposure to Estrogenic Compounds and Obesity. Birth Defects Research (Part A) 73:478–480. Wetherill, YB, CE Petre, KR Monk, A Puga, and KE Knudsen. 2002. 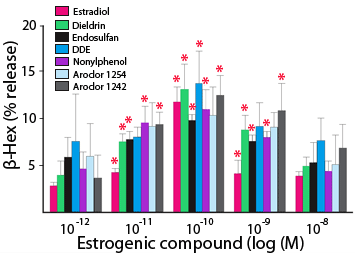 The Xenoestrogen Bisphenol A Induces Inappropriate Androgen Receptor Activation and Mitogenesis in Prostatic Adenocarcinoma Cells. Molecular Cancer Therapeutics 1: 515–524. Wozniak, AL, NN Bulayeva and CS Watson. 2005. Xenoestrogens at Picomolar to Nanomolar Concentrations Trigger Membrane Estrogen Receptor-alpha-Mediated Ca++ Fluxes and Prolactin Release in GH3/B6 Pituitary Tumor Cells. Environmental Health Perspectives 113:431-439.